My first attempt was on the 4th of February 2017. We arrived at the bothy and settled onto the wooden slats for the night in a hut that sleeps ten. I think there were fifteen of us. The next morning’s cold crept into our sleeping bags, and the bustle of rucksack-packing and lunch-making sprung life into the bothy. We set off early in different groups and followed a well-marked path through bog-ridden heather, zigzagging a little steep ascent for the first kilometre, parading under winter sun and barren skies. Soon we were on a longer, straighter, gentler ascent; traversing streams which escaped into the distance, sensing the landscape begin to close in around us. By 450 metres altitude along, we were staring at the foot of Glas Mheall Mor from the valley, and the Meall Garbh ridge was lining our view to the right. Two of our party then hacked up a frighteningly sheer face above us to our left; we watched their brightly coloured jackets shrink as they disappeared between razor-like grey rocks. They called to us to say it wasn’t safe their way, and so we continued along our path into a snow-filled mountainous horseshoe. Already the sky was whitening, and the wind picked up. We were prepared for strong winds and blanketed peaks, we were looking for Sgùrr Fiona; An Teallach’s dramatically exposed top hiding in a vast landscape of Torridonian sandstone. My last meeting with hills like these was in the summer of 2014, Glen Torridon. We scrambled up the rocky ascent to Liathach. It was August and so hot that we became convinced that these impossible mountains owned their own climate: a surreal corner of the world, living in its own time, its own economy and ecology, completely separated from the rest of the world. Scottish midges swarmed around us in the lower parts of the climb. We took a wrong turning on the summit and found ourselves scrambling down a steep, unforgivable scree slope that was not the regular route of descent. With every movement, showers of rock tumbled below and echoed so loudly that we were sure we’d cause a landslide. I was struck by a small boulder that fell from above and hit me at great speed, narrowly missing my head. It caught my left hand and carried on crashing down the mountain face. I imagined, somewhat fancifully, that I was hit with Sisyphus’s absurd boulder, and I saw him run down after it to retrieve it and then haul it back up the mountain, continuing thus in his infinite eternal punishment of repetition. I laughed and then I looked down and realised that the side of my wrist had been cut open, bleeding red over the stones beneath me, Torridonian sandstone transforming into molten rock on the exposed scree slope. The rocks in February were a reminder of this. Climbing peaks in the winter is treacherous work, the ice can be deceptive and the snow even more so. A few hours earlier spent laughing and fighting in the snow, might lead to your betrayal. The terrain works to hinder your every step; the snow has its own games as you navigate uneven ground in the night time. On bad days, each footing is an unknown. The descents are often more severe ‒ unsure steps on muddy white ground and rocky slips. The nights close faster and engulf in a thicker black than in the summer, head-torches and the moonlight are needed to guide you down benighted summits. The best days are when the stars are visible, and the worst are when snow is still falling, and wind still racing, and where you count every metre down to the bottom. 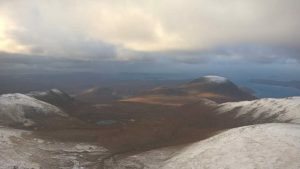 When we summitted An Teallach’s main peak at 1062 metres, Bidein a’ Ghlas Thuill, the snow was battering us sideways and there were no views from the top. Sgùrr Fiona was nowhere in sight apart from on our maps. Touching distance on flat paper. We resorted to opening our emergency shelter to take cover from the snow. Inside the shelter we ate lunch, fleeces and gloves were exchanged, and we spoke about our options going forward. We decided then that in such conditions, we had to descend the way we came. No second summit today. We’d been beaten. My second attempt was November 11th 2017. We prepared for our day on the hill and set off in usual fashion. The bog, the valley, the cairn, the ascent. The weather was looking better than nine months previous, and we were certain to summit Sgùrr Fiona. We reached the summit of Bidein a’ Ghlas Thuill at around 1pm, and we began to worry about the remaining daylight for the trek ahead. Intermittent cloud fissures showed us a glimpse of the landscape we’d missed before. What lay ahead was a kilometre of a sharp down-and-up to the peak of Sgùrr Fiona. The ridge was intimidatingly narrow, with one side dropping drastically into the valley containing Loch Toll an Loachain. We set off following the footsteps in the snow made by a group of us who had already summitted and had turned back. A few weeks ago we took a route, eight kilometres, Tower Hill to Trinity Buoy Warf on the north side of the Thames. London’s last lighthouse is now in a creative hub, with containers for artist’s studios, exhibitions, and an American diner. We passed by St. Katherine’s Docks, Wapping, and Canary Wharf; we spoke about a transforming East London. I laughed because I denounced a changing city that I’ve only known for just over two decades. London has a way of making you age quicker than usual; in the perpetual metamorphosis, it is easy to get left behind. Life goes at a normal pace elsewhere; redevelopment is gradual and you’re able to walk alongside change. London is like running towards a city that you can never catch or ever truly know. Walking is the best way to slow down. The last lighthouse remains stubborn in the midst of this force. Its height gives views across the Thames and on to the south side. The O2 Arena seems now like a feature of the natural landscape, and the buildings there seem to sink into an urban vista. There’s no inch of land left untouched, no clear city edge. It’s different at the top of the Law in Dundee. A smaller, more gentle cityscape ‒ you can look onto the Scottish vista beyond the urban sprawl, beyond the city edge. London is just infinitely urban… missing is a certain sense of security that comes from knowing your escape route. I summitted Sgùrr Fiona at 2.42pm. There was no escape route, no alternative way down, all roads were many kilometres away. The only safe way off the mountain without retracing our ascent route would involve a helicopter and a rescue team. We were alone with An Teallach. All sensible walkers were long into their descent, within reach of their cars or accommodation. We pushed on whilst there was still light to navigate comfortably, constant checks on a compass to make sure that we weren’t swerving onto unsteady cornices or dangerous valleys. The sun was quickly disappearing and there was an eagerness to get down into the valley and back to Dundonell. “To feel heather under the feet after long abstinence is one of the dearest joys I know” , and one of the greatest joys that I now know too, that transition from otherworldly rock-face to return a foot onto unfrozen heather. This terrain wasn’t so hostile under our boots. We were glad to embrace the fraoch once again. Our headtorches guided us over the streams and the marshland as we turned our back on An Teallach and escaped its difficult ways. When I think about the journeys I’ve made across the country, I wonder how many miles on foot I have been. When I was a child, maybe of 13 years, we went backpacking along the Cornish coast. We took a route from St. Ives to Newquay, and stopped at campsites to pitch our tents along the way. 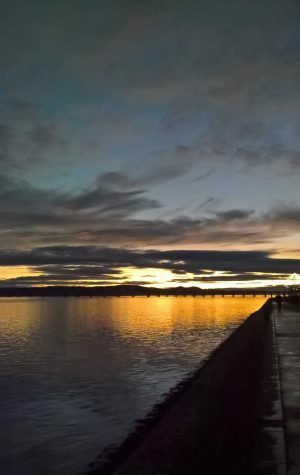 I didn’t realise it at the time, but my love of walking was started there and then; I was drawing my mark on the scenery. These journeys would become some of my best memories, whether or not I knew it at the time. Walking is freedom and attachment. Catharsis outside of the theatre: I am simultaneously free, and bound to the landscape. We were successful in getting back to the bothy- it had taken us about ten hours to complete our trip. At some time I will return to Sgùrr Fiona. The language of returning is part of the realm of mark making, but it is different. Revisiting a space is dialogue with the familiar‒ this is why some people choose to walk their dogs along the same path every day, or walk the same way to work even it it’s a little longer than the other way. People bond with journeys and routes through the medium of walking. The land you tread is essentially bound up with your journeys and movement, your walking. Each trip is a step towards becoming a “fierce see-er” like Shepherd. A walker and see-er who forms stories and memories about their days on the hills. The stories can be transcribed and pieced together, each having one thing in common with another, each constantly moving. Tomorrow I will walk a route that I choose, and consider how long my mark-making will last. The mountains are a special place for walkers. We can walk anywhere. I might follow a river, or walk backwards and forwards, or climb a Munro or a Corbitt. I could be the last guide to my city, like London’s lighthouse, the last headtorch on a dark evening. I might go back to Cornwall, or that frightening scree slope that scarred my hand. At some point our journeys in the living world will halt, but our marks will be left. In this way, walking is tied to mortality, to those who have walked before. It is primitive memory making but also the ultimate laying to rest of transient movement. Perseverance, and an affinity to the land. Carole Cadwalladr, “Frédéric Gros: Why Going For A Walk Is The Best Way To Free Your Mind”, The Guardian, 2014 <https://www.theguardian.com/books/2014/apr/20/frederic-gros-walk-nietzsche-kant> [accessed 5 December 2017]. Nan Shepherd, The Living Mountain (Edinburgh: Canongate, 2011), p. 51. Robert Macfarlane, Landmarks (London: Penguin, 2015), p. 48. “‘A Line Made By Walking’, Richard Long, 1967 | Tate”, Tate <http://www.tate.org.uk/art/artworks/long-a-line-made-by-walking-p07149> [accessed 5 December 2017]. Nan Shepherd, The Living Mountain (Edinburgh: Canongate, 2011), p. 108. Robert Macfarlane, Landmarks (London: Penguin, 2015), p. 66.